The HPA250B optimizes its air cleaning based on the amount of irritants in your environment. Honeywell has spelled relief for legions of the allergy-afflicted with some of the best of air quality products available. 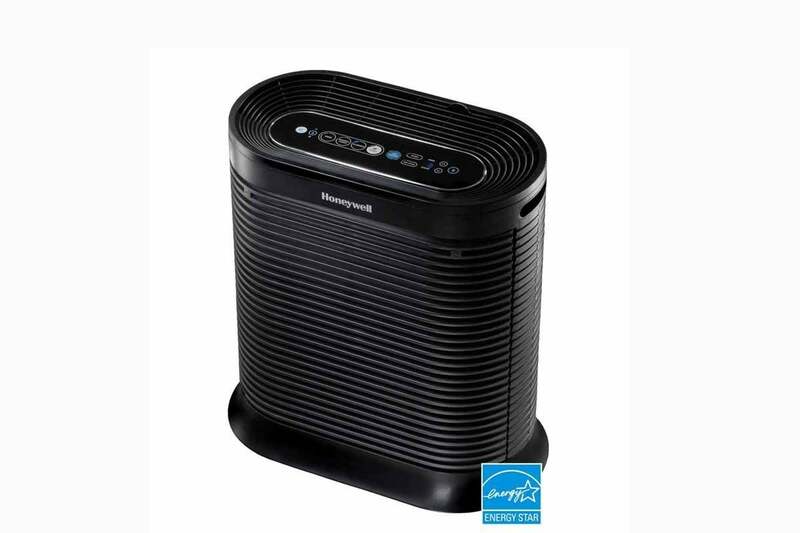 So it’s no surprise that it has produced one of the best connected air purifiers in the HPA250B ($230). Paired with your phone, it pulls the latest local allergen data to optimize its cleaning levels and purge the air of irritants. The HPA250B measures 17.72-by-10.05-by-18.86 inches and weighs just under 14 pounds. It’s small and slim enough to hide in a corner or other concealed space, which you may want to do as the plain black plastic design doesn’t really attempt to blend into home decor. Touch-based controls are arranged across the top of the purifier: Individual buttons for the four cleaning levels—Germ, General Clean, Allergen, and Turbo—plus one that activates the unit’s VOC (Volatile Organic Compound) sensor. A timer at the end of the panel programs the purifier run for one to 18 hours, after which it will automatically shut off. There's also a dimmer for adjusting the intensity of the panel’s indicator lights. The Honeywell app gives you full control of the purifer from your phone. Status lights on the unit’s control panel will change color from green to yellow to red over time to indicate the remaining life for the filters. When it’s time to replace a filter, a notification will be pushed to your deice via the Honeywell companion app. The HPA250B requires minimal setup. It comes with the filters in place, but you need to open the front grill, remove them from their plastic bags, and reseat them. Once you’ve downloaded the companion app, it will prompt you through the Bluetooth pairing process. This involves holding down the Bluetooth button on the purifier for a couple of seconds while tapping the “connect” button in the app. It sounds simple enough, but the timing is tricky and it took me three tries to get it right. The app home screen mirrors the the purifier’s control panel. A small information icon when tapped opens an overlay explaining the function of each button. The app controls are as responsive and those on the unit, with no lag between pressing a button and it initiating the appropriate action. Each of the four purification levels, starting with General, essentially increases the speed of the fan. However, all of the settings are relatively quiet, with only the quick-clean Turbo mode rising to the noise level of an air conditioner. The purifier's companion app provides up-to-date allergen levels in your zip code. If you don’t want to adjust cleaning levels manually, you can opt for one of two automatic modes. With the VOC sensor enabled, the HPA250B will detect the presence of VOCs in the room and activate the correct cleaning level. At the same time, the VOC sensor button will glow green, yellow, or red to indicate the level of VOCs in the air. 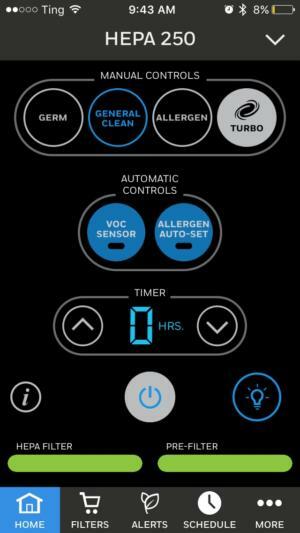 If you suffer from allergies, you’ll more likely use Allergen Auto-Set mode. Here the HPA250B leverages your phone’s GPS to automatically adjusts its settings in accordance with outdoor allergen levels. The app includes some other features to better manage the air and your allergies. 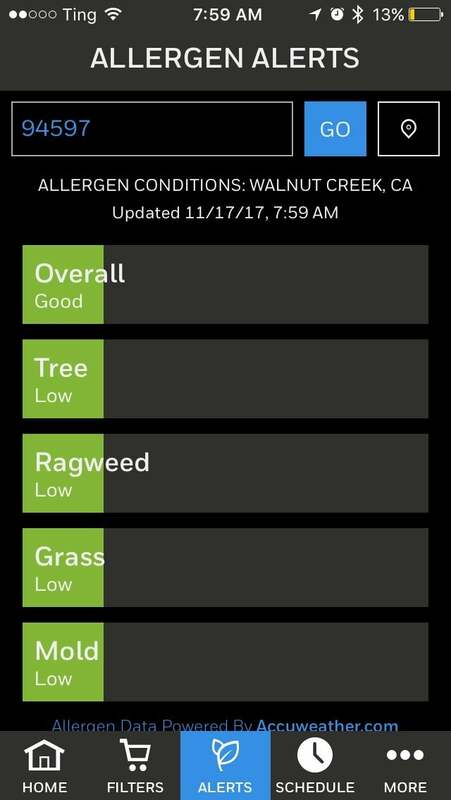 An Alerts tap provides up-to-date allergen conditions in your zip code, displayed as bar graphs for tree pollen, ragweed, grass, and mold, plus an overall rating. You can choose to be alerted when specific allergens reach “high” levels. The Filters tab included one-tap links to a quartet of retailers, including Amazon and Best Buy, that sell replacement filters for the HPA250B. The cool thing is that selecting any option takes you directly to the compatible filters and allows you to purchase them without leaving the app. On the Schedule tab, you can customize days and hours of operation as well as the purifiers settings for those time slots. One of the purifier’s most useful features, however, is buried in the settings menu. The Proximity Sensor, when activated, will trigger the HPA250B to turn on or off when you’re in or out of Bluetooth range respectively. Ostensibly, this so the purifier will shut down on its own when you leave home, but because Bluetooth range is only 30 feet, it could also do it when you walk to the other end of your house. The Honeywell HPA250B should be welcome in hay-fever sufferers homes. Its ability to automatically adjust to allergen conditions makes it worth the extra expense over a conventional air purifier. It would be nice if the system also graded indoor air quality so you could see how well it’s cleaning the air, as the Airmega 300s does, but at this price point I won’t quibble. 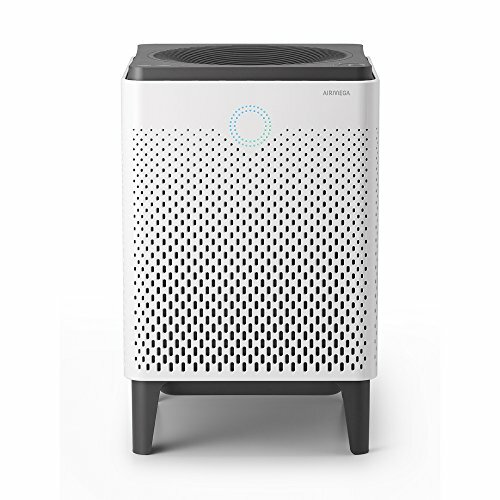 The Bluetooth Smart Air Purifier's ability to optimize cleaning to allergen levels makes it a better bet than a conventional purifier for allergy sufferers.